Political Cartoon by Hy Rosen, published in the Albany Times Union. The photo inset is captioned "Attica, N.Y. - Relatives of hostages weep outside Attica prison." 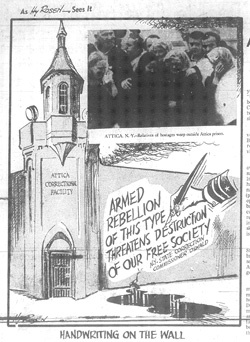 The Attica prison riot began on September 9, 1971, when about 1,000 of the approximately 2,200 inmates in the Attica Correctional Facility, in Attica NY rebelled and seized control of the prison. The riot was based in part upon prisoners' demands for better living conditions - Attica was severely overcrowded at the time - but may also have been triggered in part by an recent incident at San Quentin Prison in California, where George Jackson, a black radical activist prisoner, was shot to death by corrections officers on August 21. Forty-three staff members were taken hostage during the riot, which gave the prisoners some negotiating leverage. During the following four days, authorities agreed to many of the prisoners' demands, but there were two points on which they would not concede: amnesty from criminal prosecution for the prisoners involved in the takeover, and the removal of Attica's superintendent. As negotiations broke down and hostages' lives were threatened, state police, on the order of Governor Nelson Rockefeller, stormed the prison and regained control of Attica. When the uprising was over, 43 people were dead, including ten correctional officers and civilian employees. Headline from September 14, 1971 issue of the Albany Times Union. Attica: Slaughter at Attica, The Complete Inside Story, by James Hudson. Attica: The Official Report of the NYS Special Commission on Attica. 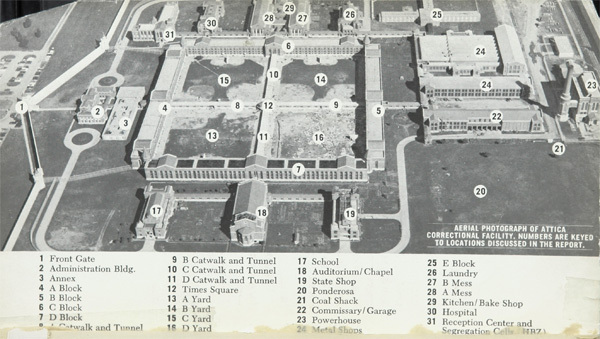 Search the catalog for other documents and books about "Attica Correctional Facility." NYS documents: Since its creation in 1818, the New York State Library has been a repository of official state publications of the legislative, executive, and judicial branches, commissions, public authorities, and other agencies of state government. The Library is the official New York State Document Depository and has the world's largest collection of New York State documents. Many State documents are available in microform, and efforts to digitize selected documents are ongoing. The 1971 Attica uprising is well-documented in this collection, which includes hearing transcripts and reports from various official inquiries and commissions. Attica: The Official Report of the NYS Special Commission on Attica (51 MB) is available online and is searchable. In addition, the Library has many supporting documents including annual and financial reports relating to the operation of Attica Prison, as well as to prison reform efforts in the aftermath of the uprising. 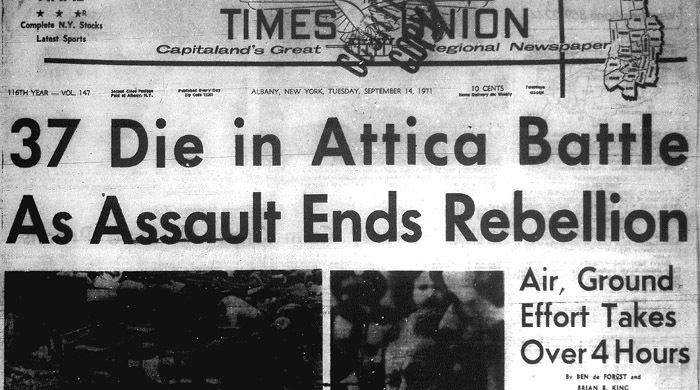 Newspapers: The events at Attica in 1971 were widely covered in national, state and local newspapers. The New York State Library maintains an extensive collection of New York State newspapers in hard-copy and microfilm, as well as online newspaper databases. Secondary sources: The State Library collects comprehensively in New York State and Local History. The library has many books about Attica (see the selected bibliography), collections of periodical literature, including a broad range of contemporary news and public affairs magazines, and scholarly journals in history and social sciences. Online sources: The New York State Library provides on-site access to a broad range of online research databases including full-text historical newspapers, and journals in history and social sciences. Remote access to these databases requires a valid New York State Library borrower's card with a P or R number. Aerial view of Attica Correctional Facility, with locations discussed in the report labelled. From the report Attica: The Official Report of the New York State Special Commission on Attica.